Twin Sheath Cable including Twin Sheath Marine Cable, in 30m and 100m rolls, available online and delivered to your door. Twin sheath cable is manufactured using oxygen free copper and RoHS compliant polyvinyl-chloride (V90 PVC) insulation in accordance with Australian and New Zealand Standard AS/NZS 3808. 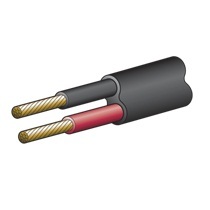 We sell a full range of twin sheath cable available in a variety of amp ratings and spool lengths.